Containing over 40,000 references and 70,000 translations, this Italian dictionary provides up-to-date coverage of contemporary vocabulary and usage. There is specific emphasis on basic vocabulary items in both English and Italian, with systematic differentiation of meanings and context. Containing over 40,000 references and 70,000 translations, this dictionary provides fully up-to-date coverage of contemporary vocabulary and usage. The wordlists have been revised and updated to take account of changes in both languages since the publication of the second edition in 1988. There is specific emphasis on basic vocabulary items in each language, with systematic differentiation of meanings and context and thousands of current constructions and illustrative phrases. 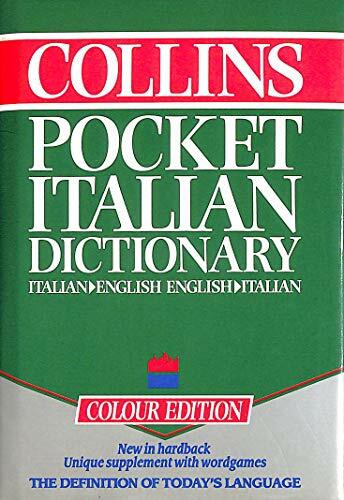 The Italian wordlist takes into account school examination syllabuses and the Council of Europe's Threshold Level for the adult learner and the English wordlist is based on the latest computational research into current English which gave rise to the "Collins Cobuild Dictionary". Pronunciation is clearly shown using the International Phonetic Alphabet and there is clear signposting of meanings and contexts to guide the user to the appropriate translation.